Along the banks of the Ouachita River is the River Grille, a rustic eatery in north Monroe. Owners Adam and Julie Hansen run the place with Chef Vada Perry. Opened in September of 2011, River Grille’s core inspiration came after the Hansen family took over Chauvin Grocery in February of 2001. “Julie and I always wanted a restaurant next door after we bought the (specialty) market,” Adam says. The humble appearance of the River Grille could be misleading: The Hansens have created a menu with dishes with creatively Southern flair. Popular dishes include the Chauvin duck wraps: tender duck breasts stuffed with cream cheese and jalapenos, adorned with a succulent sweet bourbon glaze. River Grille is also praised for its signature hand-shucked chargrilled oysters topped with diner’s choice of garlic butter with grated Parmesan cheese, spinach Madeline or their loaded version topped with pan fried bacon crisps, jalapenos and covered with cheddar cheese. 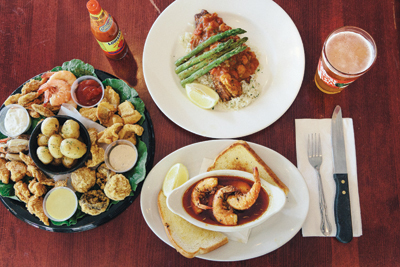 Insofar as entrée items, River Grille offers patrons with timeless classics such as crawfish and shrimp etouffee, shrimp and grits, jambalaya, gumbo or their variety of sandwiches, wraps, soups and poor boys. For all of those steak lovers in the midst, this menu will not leave you lacking. With selections from their in house hand-cut, certified choice Angus beef, diners can select from a 14 to 16 ounce ribeye or either a 6-8 ounce filet mignon, each served with a side and a trip to River Grille’s salad bar. River Grille’s diverse menu also includes entrée options for those diners who want lighter fare, specifically approved by registered dietician, Andi Holyfield, as a “healthy swap option.” Diners may find enjoyment indulging in such menu items as the Grilled Fish – diner’s choice of grilled tuna, tilapia or mahi mahi served with a lovely rice pilaf or one of the River Grille’s signature salads. Another popular option is the “signature Angus burger” – a half-pound grilled burger, fully dressed, cooked to your specifications and served with a side of fries or onion rings. River Grille offers kids selections approved by the Hansen children. Dishes include Sarah’s fried shrimp, A.J.’s grilled or fried chicken bites, Anna Grace’s gumbo, Amelia’s burger and the All-American Sadie’s Grilled Cheese.